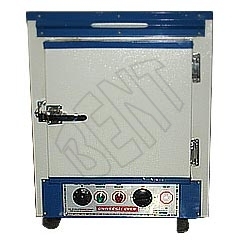 Hot Air Ovens are basically used for sterilization of different articles. They are double walled with the inner chamber made of stainless steel and aluminium. The outer body is made of mild steel duly coated with powder. It can be operated at temperatures ranging from room temperature to 200Ë�C which is thermostatically controlled. Temperature is indicated on a built in â��Lâ�� shape thermometer. It is equipped with digital temperature controller indicator with an air circulating blower. It is available in different chamber sizes.